We understand that you probably have many questions about our merchant cash advance program. Below are some of our most frequently asked questions. If you do not see an answer to your specific question here, please feel free to contact us and we'll be happy to assist you. A merchant cash advance is an alternative to traditional financing. How can NMC help me get cash? Our merchant cash advance program is a unique financing program that is not offered by banks, leasing companies and other traditional lenders. Our financing program can provide you with working capital in a hurry, often in less than a week! Since our program does not require you to make fixed payments to NMC, many small and medium sized businesses opt for our financing program because of the flexibility it provides. Why is NMC one of the most responsive options available to manage my cash flow needs? We are not a lender or a traditional source of financing! If you have been in business for more than 6 months and have at least $3,000 in monthly Visa/MasterCard sales, there is a very high likelihood that we can put cash in your hands within 3 days. No hoops to jump through, no personal collateral, no tax returns, no liens, no cumbersome fixed loan repayments keeping you up at night and no bankers saying "no." Why is NMC one of the most flexible options available? Since our financing program is not a loan, there are no fixed payments to worry about. We simply buy a portion of your future Visa/MasterCard receipts and, here is the best part: We only get paid as quickly as your business allows. In other words, the amount that you pay NMC each month is determined by how well your business performs. We are true partners in your success. We purchase a set dollar amount of your future Visa/MasterCard sales at a discount. Then, through an automated process, we seamlessly collect the set dollar amount by taking a small percentage from each of your future Visa/MasterCard sales. How do I know if I qualify for a merchant cash advance? If you have been in business more than 6 months, have at least $3,000 of monthly Visa/MasterCard receipts, and meet some other simple requirements, you will most likely qualify. Click here to start the cash advance application process. How much Financing do I qualify for? The amount of funding is based on your monthly Visa/MasterCard sales and your monthly gross volume. In general, you may qualify bank deposits up to 100% of your current average monthly credit card processing (in some cases more). What do you mean by "gross volume"? Gross volume means your total receipts from all your business transactions. This includes cash, credit card receipts, debit cards and checks. Unlike banks and other traditional lenders, we do not specify how you must use the working capital we provide. We trust you to put the money to good work, and you can use the working capital for any of your business needs. We work seamlessly with your credit card processor or ACH and retrieve an agreed upon fixed percentage of your daily Visa/MasterCard sales directly from your processor or ACH. There are no payment coupons, late fees or prepayment penalties. You can see your repayment history and remaining balance online. 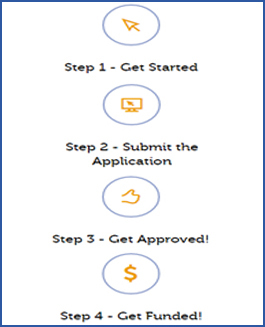 It's easy Click here to start the cash advance application process now. Approval usually takes just 24 - 48 hours.